Martin Live Production Media Center is now one of the few with an all-IP routing infrastructure, with Axia at its core. The University of Notre Dame in South Bend, Indiana, needs no introduction to academics, theologians, or sports enthusiasts the world over. It is one of the few universities to regularly rank in the top 25 in the U.S. News & World Report survey of America’s best colleges and the Learfield Sports Directors’ Cup standings of the best overall athletics programs. But Notre Dame also deserves credit for the way in which it embraces technology at the university’s state-of-the-art production facility, the Rex and Alice A. Martin Media Center, which is one of a handful of live production media centers in the world to boast an all-IP routing infrastructure. 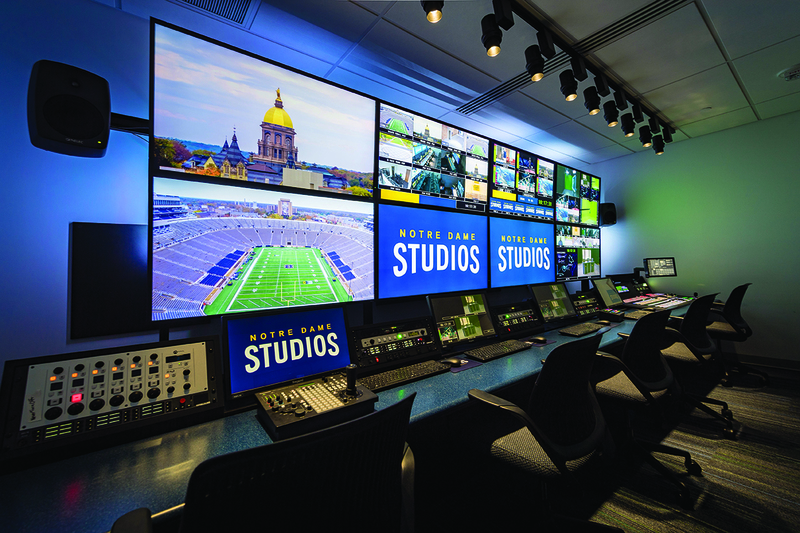 Housed within Corbett Family Hall, a brand-new building adjacent to Notre Dame Stadium, the facility significantly extends the university’s capacity and agility in supporting live and post-production. The need for in-house broadcast production was identified by vice president and James E. Rohr Director of Athletics Jack Swarbrick, who envisioned a broadcast facility as an essential asset for communicating Notre Dame’s student-athlete stories through rich media and to serve as an asset for the entire University. Swarbrick’s vision came to fruition in 2011 with the establishment of Fighting Irish Media, which began with one control room, one studio and two edit rooms. Following the success of Fighting Irish Media (FIM), university leadership began to envision what could now be possible. The 18,000sf Martin Media Center opened in August of 2017 as the preeminent university facility in the world using IP as its core foundation. Resident users of the facility include staff from FIM, the Grotto Network, and marketing/communications as well of the Office of Digital Learning. 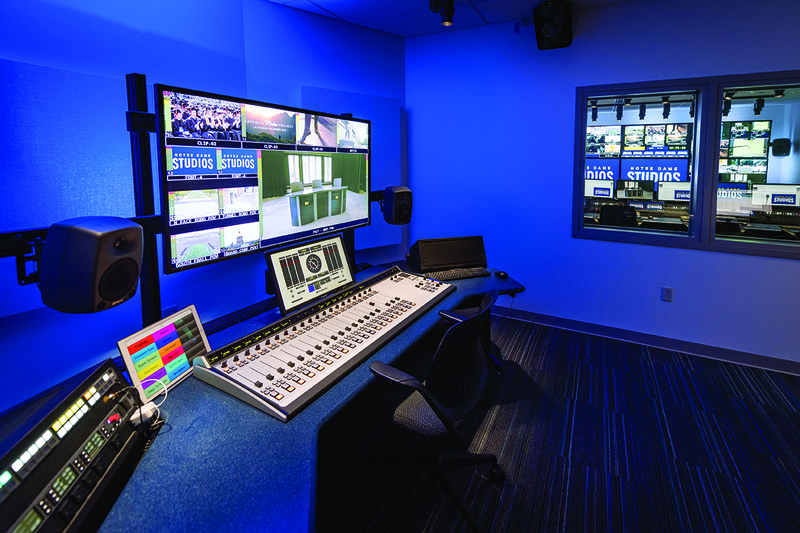 The Martin Media Center unites cutting-edge production technologies across the university’s vast campus fiber infrastructure. Reaching out to campus today are 1,400 SM fiber paths connecting everything from athletic venues to the performing arts center. An additional 1,700 strands are currently in the planning stages. 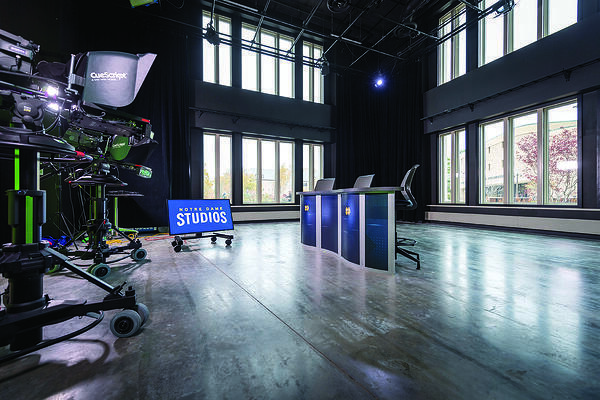 The new facility itself includes one large studio, one teaching studio, two nine-position production control rooms, two audio control rooms, a camera shading room, a slow-motion replay room, and eight fiber-connected editing suites. An Evertz EXE IP video/audio router at the system core connects spaces in the media center to three additional control rooms and one studio located at Joyce Center. 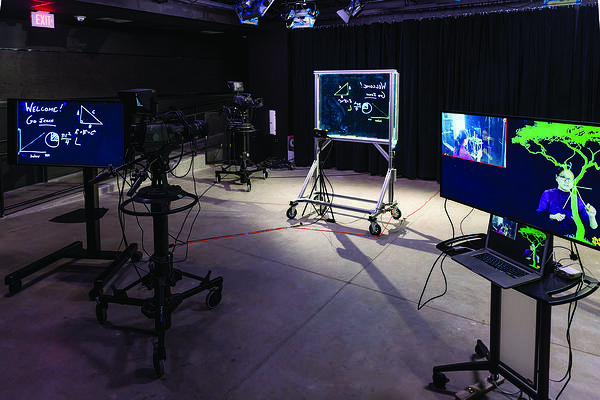 As a result, the university can use any one of five control rooms as a remote production room for any venue on campus equipped with fiber connectivity. Leading the technology portion of the initiative was Scott Rinehart, Director of Broadcast Technology for Notre Dame Studios. The design and build processes for the project were awarded to system integrator BeckTV, out of Austin, TX. Preparation for the project involved an extensive series of meetings between BeckTV and Notre Dame to discuss vision, design, equipment, cabling, primary and secondary users, and many other important factors. It was at this early stage that the critical subject of audio was discussed, specifically how it should be integrated into the IP infrastructure. “The Fusion console, being AES67 Livewire+ compliant, seamlessly receives nearly 450 AES67 streams from the Evertz router, making integration straightforward,” said Beck. The Axia Fusion IP audio console connects to the network via a single CAT-6 Ethernet cable, allowing the sharing of local audio devices and their associated GPIO control across multiple studios to maximize efficiency and reduce cost. The console has four stereo program buses, four send buses, and two return buses. “IP requires a totally different way of thinking compared to a conventional HD or SDI environment, and we’ve had to unlearn many old ways of doing things. The Axia Fusion IP audio console and the Telos Alliance xNode interfaces are helping facilitate that process." It also features auto-assigned, auto-generated mix-minus on each channel, easy individual or group talkback for remote talent cueing, one-button off-air phone record mode, and up to 99 show profiles to set, save, and recall console layouts for specific shows or individual operators. Axia Fusion IP consoles are installed in two state-of-the- art control rooms in the Martin Media Center as well as in the two original control rooms. In addition to the Axia Fusion IP audio consoles, the system employs Telos Alliance xNode media interfaces that made setting up the AoIP network fast and simple. The xNodes are largely self-configuring, so setup involves simply plugging them into the network, assigning an ID, and connecting audio sources. The rich feature set of the Axia Fusion IP audio console is advantageous not only to the professionals working in these state-of-the-art control rooms but to students as well. Rinehart notes that although the console is designed for professional use, it includes intuitive features and enough safeguards to support learning and use by students, and the system will prevent accidental errors such as changing an audio source during live broadcasts. Additionally, Axia xSelectors are employed in multiple positions throughout the facility for confidence monitoring, while the Axia RAQ rackmount console is used as the master loudspeaker source selector in the Production Control Rooms. Moving forward, Rinehart says the capabilities of the IP infrastructure will allow them to fully utilize the multi-dimensional Martin Media Center to support athletics, faith, media relations, academics, distance learning, team building, training, HR, and more. And, as it evolves, the Telos Alliance and Axia AoIP solutions will be further leveraged to bring new venues on board. Interested in getting your own facility dialed in with Axia or other solutions from the Telos Alliance? Drop us a line! The Sahara template pack includes multiple options for every possible web-related need. The complete pack of templates includes multiple versions of individual site pages, landing pages, blog templates, email templates, and much more. You can select your favorite of each, creating a totally unique website. Telos Wins Awards for Hot New Products, Creates Rock Legends, and Ends NAB 2019 with Style!